Fifty years ago my first encounter with mycorrhiza was in the Duneman seed bed. Foresters would sow their trees in a seedbed of composted deciduous and coniferous leaf litter. 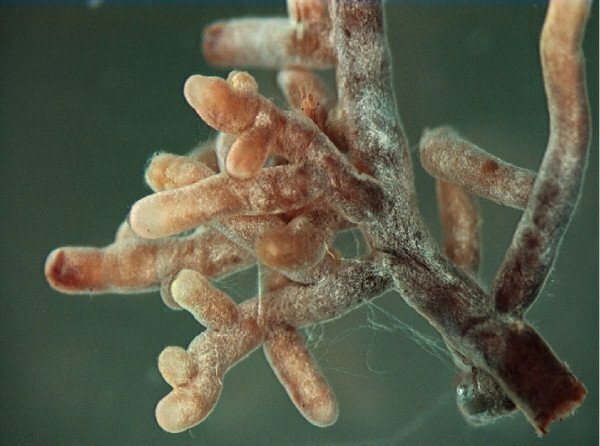 Because of the natural symbiotic association between soil-living fungus and plant, mimicking the forest floor, the technique produced very fine sturdy plants. Now, when I pop down the road and see my friend Peter Williams’ strong seed-raised cut leaf maples I think I see the same thing. He sows and raises his fine plants in his home made mix of well composted leaf litter and mown grass. Ninety five percent of plants in the wild form mycorrhizal associations. This mutual arrangement enables them to thrive and in some cases mycorrhiza are needed for the plants to survive. All the bluebells in a natural wood are not only connected, one with another by fungal strands, without mycorrhiza they would die. In the past farmers and growers have neglected the potential of mycorrhiza and generally have achieved quality and yield without their help. Agricultural practices such as soil cultivation and heavy use of fertilizers hugely inhibit this beneficial fungus ‘infection’. Minimum cultivation is now seen to be a route to enjoy nature’s help. Imagine a wood covered with bluebells. 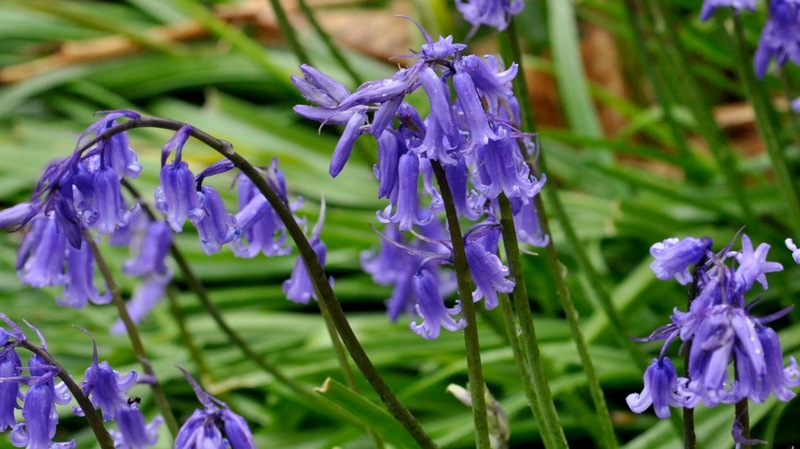 Without mycorrhiza the wood would have no bluebells at all. The botanical details of different symbiotic associations between plants and a myriad of different fungi vary, but all involve fungal mycelium ‘invading’ plant tissue and at the same time penetrating the soil. In return for the ‘services’ it renders, mycorrhizal fungi receive a rich supply of sugars from plants. Fungal hyphae (strands) penetrate deeply and intimately into the soil creating a huge surface area of contact which vastly increases the absorptive ability of roots. The nutrient phosphate is frequently locked up in insoluble form in the soil. Mycorrhiza enable the plant to extract it. Other nutrients, including nitrogen and trace elements are extracted from the soil and sometimes come from unexpected sources such as decaying woody vegetation and harmful soil organisms killed by a fungus! Soluble organic materials can be exchanged between fungus and plant. Some fungal diseases are inhibited and harmful soil nematodes may be killed. Nitrogen fixation can be enhanced. Better plant growth on soils contaminated with toxic heavy metals. Nutrients are preserved from leeching within the combined fungus/plant system. In recent years there has been an explosion in our knowledge of mycorrhizae and neglected research and new knowledge has now reached the public and farming domain. Scientists now understand how plants are connected one with another in the wild. This may involve interconnections between many different species of plant and fungus. Fungal networks exchange sugar, nutrients and organic materials. Plants such as trees contribute disproportional amounts of sugar and have a profound effect on surrounding soil ecology. 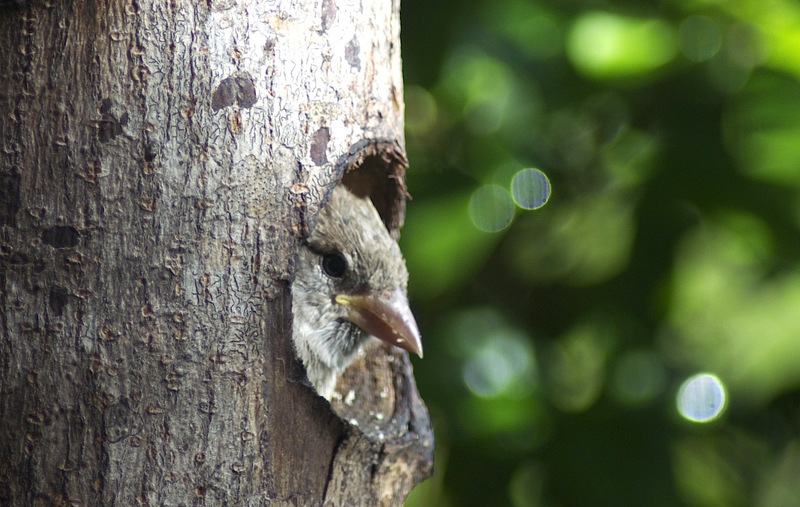 Young plants sometimes receive sustenance from their parents. Plants chemically communicate information about invading pest and disease. It is now recognised that mycorrhiza help plants withstand drought. Only recently has the full significance been given to how mycorrhiza and associated fungi improve soil. In 1996 the fungal protein glomalin was discovered. Apart from ‘true’ humus it is probably the most long lasting organic constituent of soil. It binds together soil particles and is a powerful beneficial influence on soil structure. Recent research shows how the strong penetrative forces of fungal mycelium can even penetrate rock! Our children will probably learn in future geography lessons how mycorrhiza helps to form soils! Most growing media provide natural access to mycorrhizal propagules and spores. Many man made environments however, are deficient, and a new industry has emerged that sells fungus inoculum. Such products have an important role in ‘seeding’ fungal-deprived media. I have no idea whatsoever how great a contribution these much hyped products can make to everyday garden use. I am sceptical, but wait to be convinced! I would love to hear from readers who have used these products. You are not chopping up roots and mycorrhiza. The marriage between plant and fungus is maintained. Every time cultivations take place the plant and fungus have to start their relationship again! Please excuse my exaggeration, in established plantings, deep root/fungus connections will survive cultivation. My cemetery gardens never receive fertilizer and the soil is not cultivated at all. My weed control is with glyphosate and the soil is undisturbed. With zero cultivation virtually all of my plants will benefit from rich fungal associations. I was interested to read this website which describes how when weeds are killed by cultivation their mycorrhizal contribution to the soil is lost. It’s the same when they are killed with herbicide, except that the beneficial fungus has time to lay down spores and propagules before it dies. Integral to no dig gardening is to grow plenty of plants. I now realize that this post on green manuring fails to recognize its mycorrhizal contribution. Brassicas are one of the few plants that do not form mycorrhizal associations. I wonder if this is why with no mycorrhiza to help them they have evolved such wonderful deep penetrating roots. In the words of one blog follower the brassica, daikon radish, ‘busts open’ clay soil. I have often wondered that whilst mycorrhiza are so common one rarely sees them with the naked eye. My microbiologist friend Peter Williams has just sent me this picture of mycorrhiza on the roots of Sorbus aucuparia that he had dug up in his woodland garden. He reminded me that they have lovely characteristic fresh fungus smell. When exposed to the naked air within a few minutes their delicate membranes disintegrate and you can no longer see them. A certain traveller who knew many continents was asked what he found most remarkable of all. He replied the ubiquity of sparrows. Wake me up with a familiar tune. Tell me not of joy: there’s none. 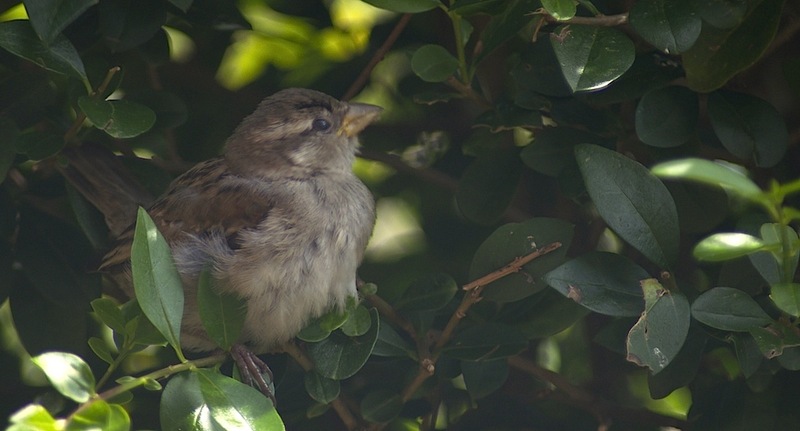 Now my little sparrows gone. 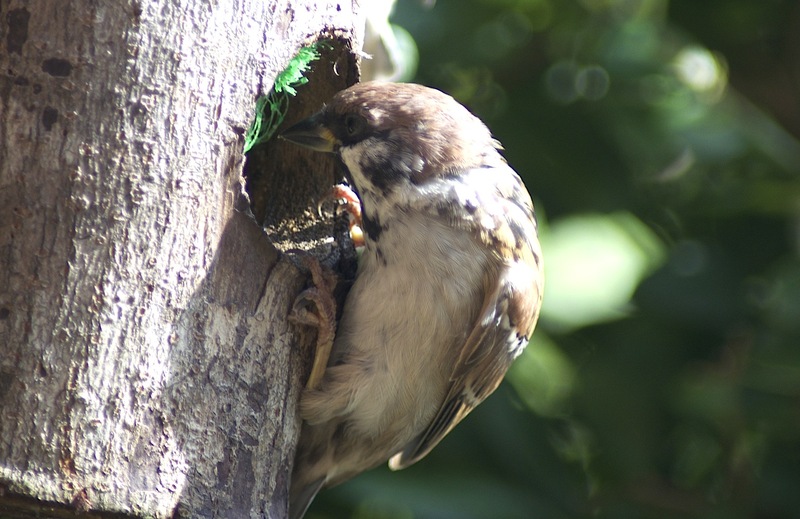 I once had a sparrow alight upon my shoulder for a moment while I was hoeing in a village garden and felt that I was more distinguished by that circumstance that I should have been by any epaulet I could have worn. The genius of Harry Poole. More of Harry’s pictures. I had just been given permission to hold the National Dicentra collection. I had all of five plants! I received a letter from a lady called Joyce Fussey. She was a keen hardy planter and she had raised a white dicentra from seed. She had no memory of where the seed had come from. One of many seed distribution schemes. Did I think the dicentra was worthy of wider distribution? Her son drove her over from Goathland. Joyce does not drive. Joyce is a gifted authoress. She used to write her books in the cold North Yorkshire winter and tended her garden all the year round. She writes of her life on a small farm which nestles at the lip of a deep valley. She tells me that she has experienced frost in every single month of the year, Fortunately not in the same one! Her books are delightful hilarious accounts of farm life and tales of amusing and sometimes riotous incidents in her garden. I saw one of her old meadows in full bloom. Never having been treated with a herbicide, it was a riot of wild flowers. It was the most beautiful display I have ever seen. You just might have seen parts of her garden! The popular TV series ‘Heartbeat’ was filmed in the area, her garden was sometimes used as a set. Her books are delightful. They have wonderful titles such as ‘Milk my ewes and weep’, ‘Cows in the corn’ and ‘Cats in the coffee’. Her books never made ‘the big-time’. A different shake of life’s dice and she would have had a James Heriot acclaim. Joyce is not rich in possessions but she is in her life. Originally without mains electricity she has taken delight in her garden and simple country matters. She tells me of the particular thrill she still gets when one of her admirers has sought her out and called. She has had visitors from all over the world. I can’t help thinking that had she been a few years younger she would have had a very fine blog! I planted it my garden, my expanding collection. It was a very fine form of Dicentra formosa alba. It perhaps had larger flowers than the type, perhaps it flowered a little longer because it did not readily self seed. I gave it my ill-informed approval. Joyce wrote to nurseryman Adrian Bloom. He came north to see it, he liked it. He liked it even more when I informed him that my colleague Philip Orton had thousands of micro-propagated plants in his lab at Askham Bryan College. I think I glimpsed a gleam in his eye! Adrian undertook to undertake the registration and promotion of this fine plant for sale throughout Europe. I wanted to call the dicentra ‘Joyce Fussey’, she deserved the accolade and it would promote her name. Adrian said “with that name it won’t sell”. It was to be called ‘Avalanche’, you can just sense the rush of the brilliant white flowers. It was to be launched at Chelsea. Joyce, Philip and myself were invited to the celebrity day. My two friends had a wonderful time and the dicentra was featured on the BBC. Much to my regret, this nitwit here, elected to remain at college to give his lectures. As if the poor students wanted to hear them! And so ‘Snowflakes’ was born! Snowflakes! what about ‘Avalanche’? Think about it, to the British it sounds exciting, to the rest of the world it’s image is one of tragedy and death. 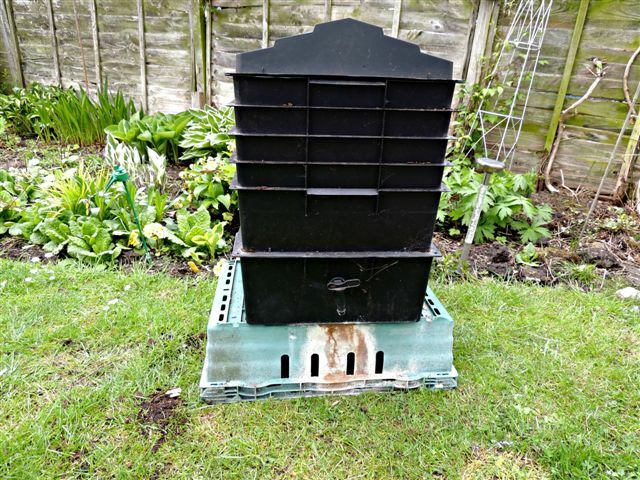 It appeared in Bressingham Gardens catalogue. It graced thousands of gardens. It was available for some years and generally offered in the trade. It disappeared! I know no one who has it now. I might have lost it myself! For some reason it did not have the constitution. Perhaps it had mutated in micro-propagation to give a weak ‘sport’. Perhaps it was susceptable to a virus. I don’t know. 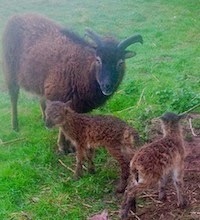 Three years ago I called on Joyce and she retrieved a plant from under an old hedge and gave me some of the original none micro-propagated stock. On the same day I bought a plant from Pat Perry’s nursery at Sleights as we went on to Whitby. It was labelled ‘locally bred’. Shame on me I have lost it again! Many of us lost our best plants in the 2010 winter when we had tried to keep special plants safe and potted them to hold in our unheated greenhouses. It was the worst thing to do. Plants were frozen solid in their pots when they would have survived in the ground. Dare I ask Joyce for some more? I feel another trip to the seaside is due. Dicentra ‘Adrian Bloom’. 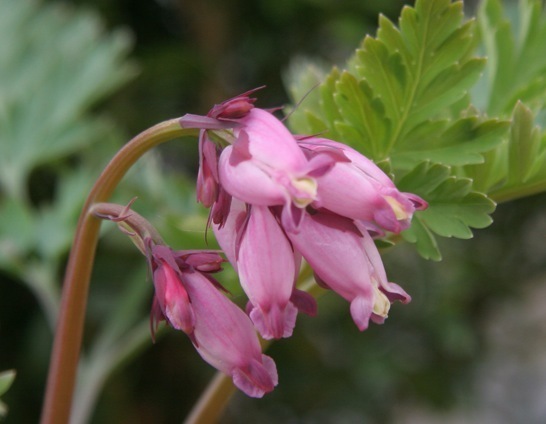 As son of plantsman Alan Bloom, Adrian has a dicentra that bears his name. Dicentras vary slightly in colour depending on season, degree of shade and soil. This is in my opinion the true colour of D. Adrian Bloom. Adrian jovially declared that Dicentra “Adrian Bloom’ did not grow well in his garden! But this similar darker red cultivar ‘Bacchanal’ does! The correct name of Joyce’s White dicentra was Dicentra formosa alba ‘Snowflakes’ All similar white dicentras sold in the UK are also Dicentra formosa alba. If they are labelled Dicentra eximia alba they are almost certainly named wrong! The flowers of D.eximia and ‘D.formosa’ are completely different. The picture below shows the long elegant shape of D.eximia. All the other pictures in this post shows the short dumpy flowers typical of D.formosa. This is the flower of Dicentra eximia. Anyone wanting to grow genuine (pink) Dicentra eximia can buy seed from Chilterns. Dicentra eximia alba does exist in the USA - pictures can be seen on the net. Examine the shape of the flower carefully. 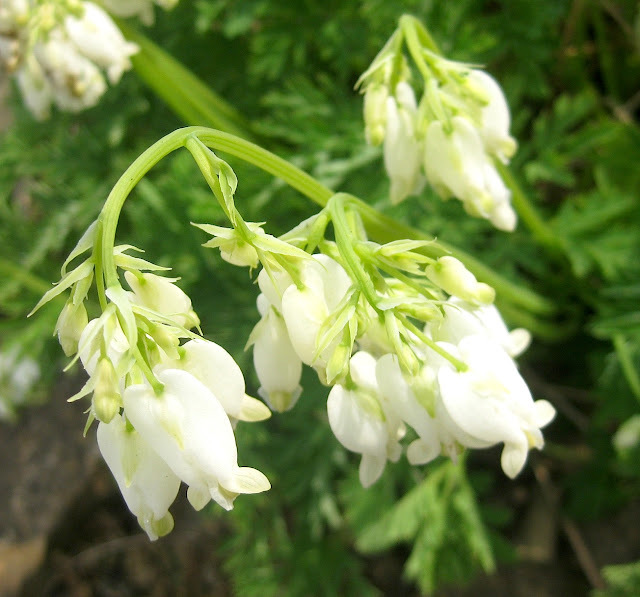 You will find a huge array of white dicentra, some incorrectly named. In google images I find my own picture of Dicentra formosa oregana ‘Pearl Drops’ under the search-term of Dicentra eximia alba! 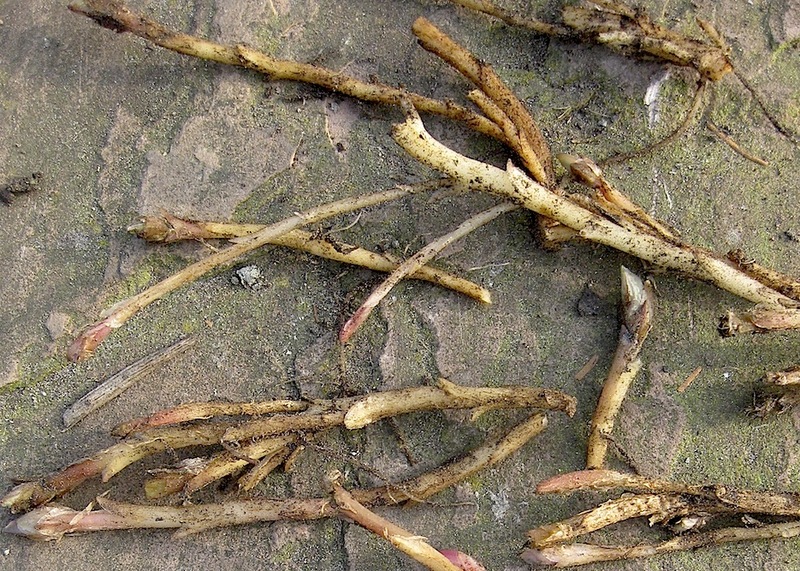 Dicentra formosa has these characteristic underground rhizomes. Dicentra eximia does not. Sudden shrub death. Why has my previously healthy shrub died? I went down to the village plot a week ago and found a well established Viburnum davidii and Clematis montana completely dead. As the picture shows a large dead Lonicera purpusii had reduced to a small surviving portion! I did not need to be a Sherlock to know the reason why. The beck at the side of the plot has it’s outlet blocked and in this wet winter had flooded a portion of the plot for more than a month. Although roots are relatively tolerant to flooding when it is cold in winter, this had been too much. The roots had died for lack of aeration. Other more tolerant shrubs and herbaceous plants had survived. I was not a good day! 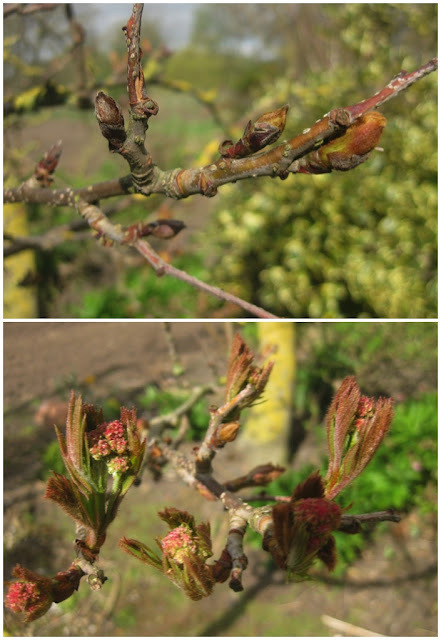 At the bottom of my own garden the buds of a five year old sorbus were starting to abort and go brown. Worse, a wonderful large azalea given to me by Peter Williams a year ago had the same symptoms. Our horrible wet year had been supportive to get the azalea established but now it was dying! I am relatively confident of the drainage of this low lying part of my garden, but in winter I know the water table can be high. Deep roots had died! It is a very common gardening phenomenon for such plants to die of drought in spring when the weather turns dry. And boy, has it turned dry. There has been no appreciable rain since January and dehydrating winds have almost continuously blown for months. I emptied a few buckets of water onto these two plants. Just in time. Surviving buds are now growing strongly. The plant said “thank you, for saving my life”. I congratulated myself and Brenda chastised me for not doing anything sooner! A word of warning, Deeper down my soil is still wet. My heavy watering gives the plants respite to make new roots and capillary contacts to be strengthened . Unless it remains very dry I won’t be watering again. 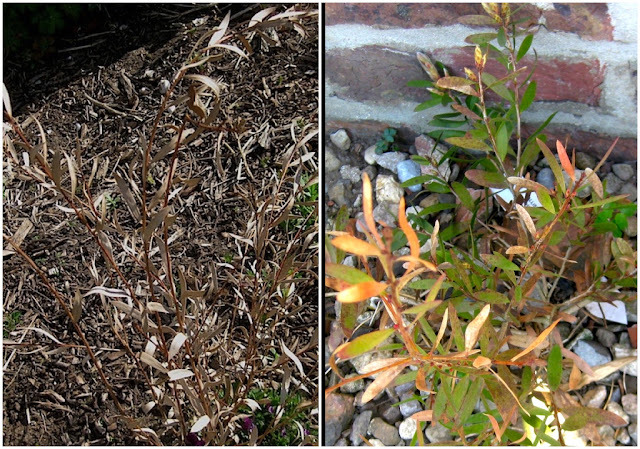 This normally evergreen golden privet has been scorched by harsh freezing winds. I am completely confident that in a month it will have beautiful foliage. For a year or two I worked as a ‘hands on’ horticultural consultant for a day every week at a very grand garden. The owners required a rapid makeover of an area for an important domestic occasion. Unprepared two foot high open-ground junipers from their own nursery were planted ever so carefully by one of the gardeners in September. Lifting unprepared plants - they should have been undercut several months sooner - caused considerable root damage. I knew they would survive the winter when the soil would be wet, but that they would be vulnerable when it dried in Spring. Although it was not my own project, I took on an undeclared watching brief. Unfortunately I missed my weekly visit in a very dehydrating dry windy Spring spell. When I returned and arranged a heavy watering it was too late for half of the plants! My friend Iris’s front garden is on a gentle slope parallel to the road and which runs at ninety degrees to her garden. The garden itself is almost level. She was a very proud of her young birch which was well established and growing vigorously. Two years ago York had a spell of a few days of torrential summer rain. Typical of our area, nature then ‘turned the tap off’ for several weeks after. Iris was distressed to find her beloved birch severely wilting and showing signs of imminent death. A couple of buckets of water reversed the decline and it is now a very fine tree. Slopes are notorious for causing drainage problems. Sub-surface water had drained down the slope and it’s descent had been slowed by Iris’s flat garden. Roots in summer are highly sensitive to waterlogging and roots die for lack of aeration. When her tree, after six weeks of drought started to show signs of distress, Iris’s single watering gave the plant sufficient respite to make new roots and subsequently thrive. Inexperienced gardeners beware, plants can wilt because they are still waterlogged! Do not water these! This phenomenon is often seen with overwatered house plants. Years ago I had had a similar experience. I was very proud of my cherry tree ‘Stella’ grafted on the then new, dwarfing rootstock ‘Colt’. Rootstocks are relevant to these matters of root sensitivities to poor aeration. My tree was extremely healthy and had been established three years. Their was a slight dip in the land contour and it was a very wet summer spell. Two weeks after very heavy rain my beloved plant was dead. A lady had planted a new hedge and the weather turned dry. She was correctly advised to generously water with several buckets of water. If drought continued it would have been good practice to repeat heavy watering, perhaps every ten days. Unfortunately to ‘make sure’ she generously watered them every night! On her heavy clay soil she created waterlogged conditions, roots were deprived of air and the hedge died. This wind exposed callistemon was killed by minus twelve degrees centigrade of cold. The same variety sheltered by a wall survived. Although in this case there is no hope for my dead plant, sometimes cold-killed tops regenerate from roots in the ground. Only when satisfied that the top is completely dead cut hard to the ground. Do not dig them out. We have a fine Betula jaquemontii. Brenda ‘suggested’ we should have a ‘grove’ of three. After several months of persistent negotiation I agreed. A local nursery had some very fine open ground plants. I ordered two and called later that day to collect the newly lifted trees. They were deceptively well wrapped with moist compost. I subsequently deduced that perhaps in a tea break, they had been left on the soil surface and been allowed to dry. Bare-rooted-tree roots must never be allowed to dry out . Planted in March the buds refused to open and by June the buds were starting to die. Peter Williams agreed with my own diagnosis and they were pronounced ‘dead ducks’ and I cut them down to the ground. I went out and bought two well rooted containerised trees. Three weeks later the cut back birch started to sprout. I now have a grove of five! Peter gave me a fine container-grown cotinus last Spring. It showed some dieback last Autumn and is now completely dead. I do not know why! You can check a shrub is dead by bending branches and finding them brittle. When you scrape such branches there is no live green tissue. One definition of a gardening expert is that he is a person who knows why his plant has died. There are many causes of tree and shrub death and some come straight from the garden centre. 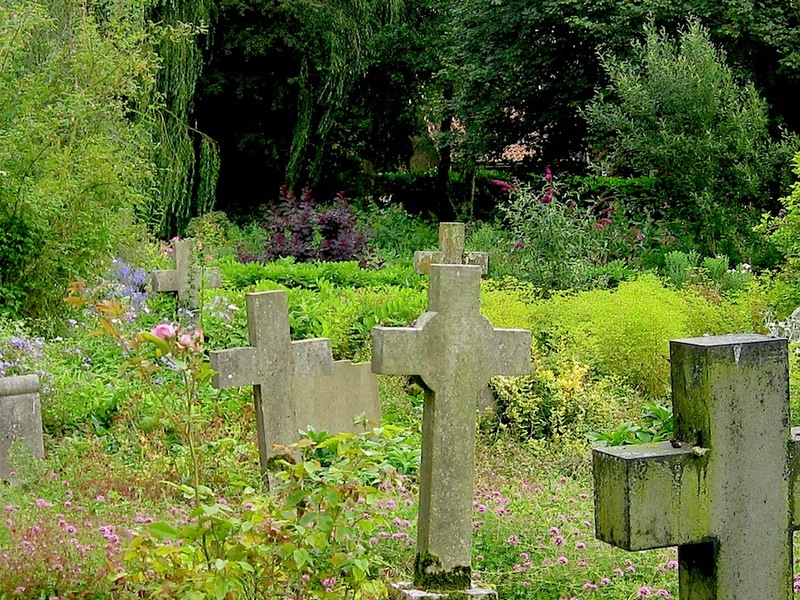 I would be very grateful to hear of reader’s experiences of sudden plant death. Judging by the large number of ‘hits’ I caught a raw nerve with my post about my cold-damaged Garrya elliptica. After I posted, it became considerably browner but as you can see from the pictures it is now on the mend. 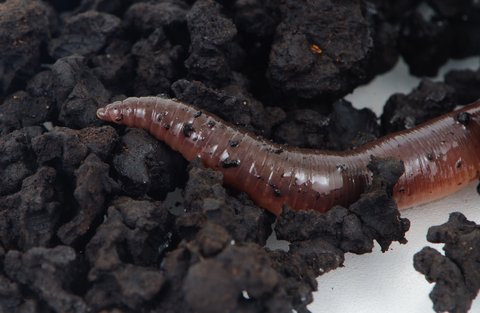 Minimum cultivation methods are repeatedly shown to increase worm populations. 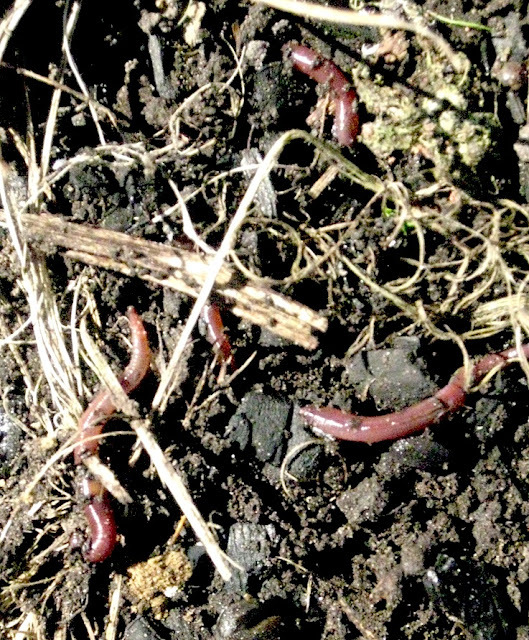 Why are those people who care about worms, not up in arms about soil cultivation which destroys worm habitat? 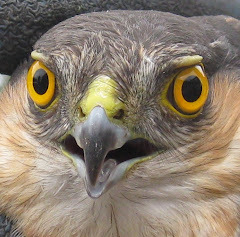 Where are the protests against rotavators that shred worms? This March, all soil surfaces in my zero cultivated, glyphosate-sprayed, cemetery garden were completely covered in earthworm casts. Counts in excess of a thousand per square meter are not uncommon. Darwin was wrong! Never did I think I would write these words about my all time hero who did more than anyone else to research and promote the merits of worms. It’s just that even he underestimated how many worms there can be. Agricultural grassland can contain a greater weight of worms than the cattle that graze! There are many species of worms. More than 150 of horticultural significance worldwide. All have varying habitats, many in most unlikely places. Perhaps the two most common to gardeners - both usually graced by their latin names - are the night crawler, Lumbricus terrestris and the brandling or tiger worm, Eisenia fetida. The night crawler may be found all the way down to a couple of meters, whereas eisenia is found in decaying vegetation and manure and barely survives in a mineral soil. The benefits of worms to are huge. Their tunnels permeate the soil and provide aeration, drainage and easy root penetration. It has been pointed out by Bill Mollison, a founder of Permaculture, that as worms move through the ground they act like pistons sweeping air through their tunnels. They redistribute organic matter and in particular pull surface vegetation into the ground. They intimately mix soil particles and organic matter in their gut. They create water-stable aggregates (crumbs) of sand, silt and especially clay. Nutrients are concentrated in their castings. Compared with figures for surrounding topsoil there are enhanced levels, typically nitrogen x 5, phosphate x 7 and potash x 11. They shift soil! A single worm might cast as much as 5kg of soil in a year! Some species destroy harmful soil nematodes in their gut. Their casts are rich in biologically active microbes. Could it be that worms are ever unwanted? Because some worms cast at the soil surface green-keepers do not like them.The same casts are of huge benefit when they occur in the none-digger’s vegetable garden when he wishes to make a tilth. For the domestic lawn, I believe worms to be beneficial. I was a little taken aback at the criticism of my recent post when I mentioned that my use of iron sulphate as a moss killer also discourages casting worms. 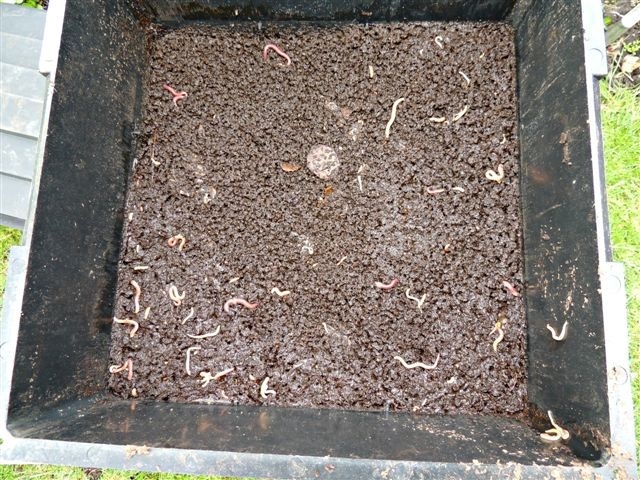 My critics have a point, but I would argue that the effect of iron sulphate on overall worm population is small and does little harm to the deep crawlers. The surface casting types - the minority - just migrate to my borders. Compared to the huge shifts in worm populations caused by the environment and meteorological factors the detrimental effects of a gardener’s activities such as his limited use of fertilizers and weedkillers is small. Some gardeners worry that worms might clog the drainage holes in their pots. I have no such concerns and just ignore them. The burrows they create has been known to destroy earth dams! As described in Amy Stewart’s fine book, introduced none-native worm species, can destroy natural woodland habitat. Worms’ very efficiency in mixing organic matter into the soil removes surface decaying vegetation, the natural niche for many wild plants. They bury things! I am being a little frivolous here! My thirty year old rock garden stones in my previous home virtually disappeared! Whenever I shift logs that have been standing on the ground I see evidence of the soil that earthworms move. Could worms be a partial cause of the burial of archeological remains? But some good news for gardeners! Although many fine public gardens are host to the New Zealand flatworm, (they just don’t tell you), this dreaded nematode predator of worms is not proving to be the scourge we once feared. What can the gardener do to encourage worms? Leave dead weeds, leaves and other organic debris on the soil surface. 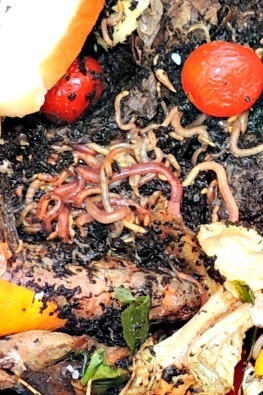 Many worms like a neutral or slightly alkaline soil. Their digestive juices need calcium. On acid soil applying lime may help. Grow plants! Perhaps in my post about green manure I neglected to mention how good it is for worms. And they love clover! 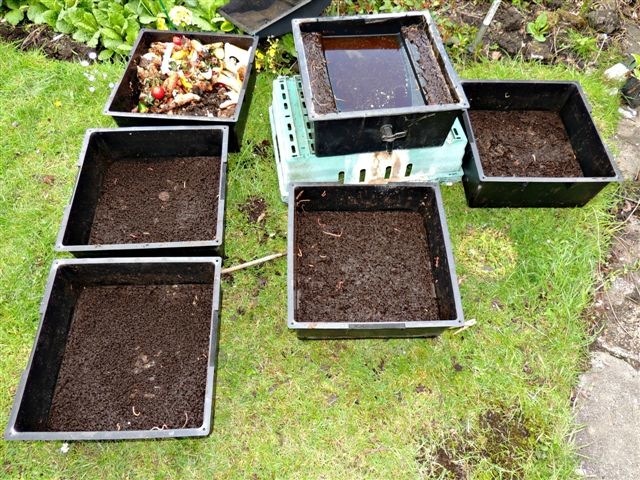 Add garden compost and well rotted manure. Peter Williams has let me have these fine pictures of Tulipa clusiana. They were taken in his greenhouse at ten minute intervals. As the morning temperature rises they open extremely rapidly, presenting themselves for potential insect pollination. Later in the day when temperatures fall or light fades, they close. This plant movement is an example of thermonasty, a plant movement in response to temperature. Lady-tulips can be seen outside in their full glory at Peter’s Open Day tomorrow! My own naturalised tulip, ‘Little Beauty’ is also thermonastic. Personally, I like tulips in tight bud when they do not open at all on a dull rainy day.